Former French President Nicolas Sarkozy has been placed under formal investigation over allegations he received campaign funding from late Libyan leader Muammar Gaddafi. Mr Sarkozy, 63, has denied wrongdoing. He says his Libyan accusers are seeking vengeance for his decision to deploy French warplanes during the uprising which overthrew Gaddafi in 2011. 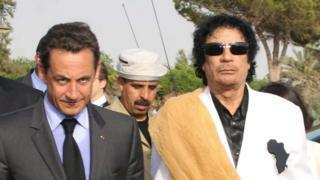 In 2013, France opened an investigation into allegations that Mr Sarkozy's campaign had benefited from millions of euros of illicit funds from Gaddafi. One of Mr Sarkozy's former ministers and a close ally, Brice Hortefeux, was also reportedly questioned by police on Tuesday. A former aide, Alexandre Djouhri, is fighting extradition to France after being arrested in London in January on suspicion of money laundering as part of the case. The Swiss businessman has denied the allegation and says the investigation is politically motivated, according to Reuters news agency. The claims about funding from Gaddafi came from a French-Lebanese businessman, Ziad Takieddine, and some former Gaddafi regime officials. Mr Sarkozy was detained in 2014 in a separate investigation into alleged campaign funding abuses - the first time this has happened to a French ex-president. What are the specific allegations in the Libya case? In November 2016, Ziad Takieddine told the French news website Mediapart that in 2006-2007 he had handed over three suitcases stuffed with 200- and 500-euro notes to Mr Sarkozy and Claude Guéant, who was his chief of staff. Mr Guéant, who was managing Mr Sarkozy's presidential campaign at the time, told the franceinfo website on Tuesday that he had "never seen a penny of Libyan financing". He was placed under formal investigation earlier this year over a €500,000 bank transfer in 2008. He has denied wrongdoing and claimed the money came from the sale of two paintings. French daily Le Monde reported that Bashir Saleh, who ran Libya's sovereign wealth fund at the time, had confirmed that Gaddafi had financed Mr Sarkozy. Possible charges in this case would be influence peddling, fraud, handling of stolen goods and money laundering. What about the other Sarkozy investigations? Criminal proceedings have been launched against Mr Sarkozy in one other case of alleged illicit campaign financing. Mr Sarkozy denies he was aware of the overspending. The affair is known as the Bygmalion scandal. In connection with his 2007 campaign, Mr Sarkozy was previously cleared over claims that he had used secret funding from L'Oreal heiress Liliane Bettencourt and that he had tried to influence investigating magistrates.